I went to the doctor yesterday for our first appointment with baby #7! We saw the heartbeat and it was glorious!!! I cried like I do every time... 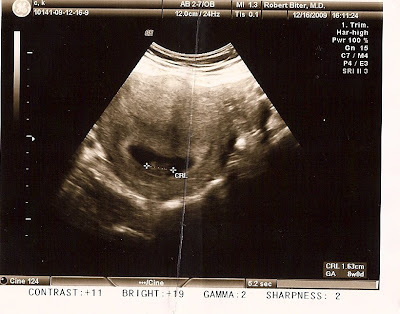 I know that the baby kinda just looks like a blob on a screen at this point. But for some reason seeing that little heart beating, when just a few weeks ago there was nothing there, just never ceases to amaze me and captivate my heart. The Doc said, "So far so good." We'll be able to see things better at our next appointment in January. Our official due date is July 30th, 2010.